The World Cup semifinals are already here: Uruguay-Holland and Germany-Spain. If a month ago, at the time the tournament was kicking off, the three European squads were in the shortlists of favorites of many soccer fans and very few people, if any, had Uruguay in their heads. After the group-stage of the World Cup many voices claimed that the Latin American soccer was on top of the European one but after a couple of rounds it seems quite obvious that Europe has excelled. But leaving fans aside, it was quite interesting to see that bankers themselves also made their predictions about who would be winning the Cup. For instance, JP Morgan pulled together a model based on four metrics: (1) "valuation" ("market valuations of the teams and FIFA rankings), (2) "market & analyst sentiment" (result expectations and recent team shape), (3) "company fundamentals (consistency in market sentiment and JPM's success ratio), and (4) "price trend" (trend in probability to win and trend in FIFA ranking. Based on the model, Brazil was the strongest team in the World followed by Spain, England and Holland. Germany and Uruguay trailed on the 12th and 18th spots of the rankings. In other words, we could say that JP Morgan's model accurately predicted two (Spain and Holland) of the four semi-finalists. winner - among the favorites). 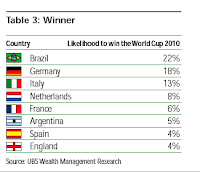 Finally, UBS has also produced a thorough report about the World Cup and about South Africa in general. 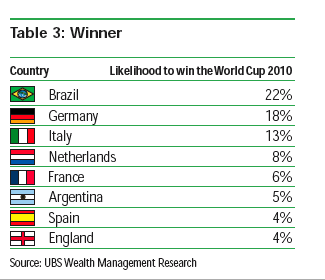 According to UBS, Brazil, Germany, Italy and Holland were the countries more likely to win the Cup. That translates into UBS guessing right two (Germany and Holland) of the four semi-finalists. All in all, this means a technical tie among the three investment banks, with each of them guessing two of the four semi-finalists, though the three of them provide different estimates. What it is obvious is that none of them got the right answer for their most likely winner, Brazil. 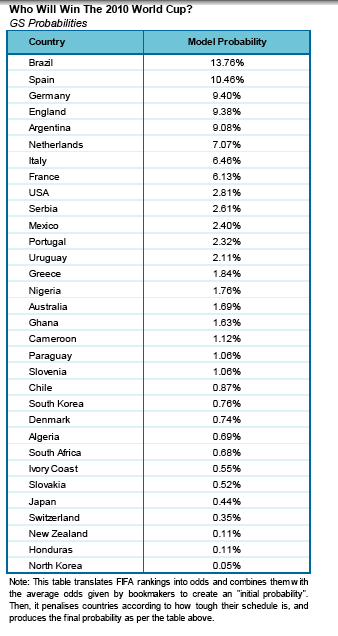 Spain comes second in JPM's and GS' reports. Hope they are right! !